Like all our furniture at Iris, our selection of hand crafted and finished desks are an incredible display of high end, flawless, statements of design. Each and every desk we make is created in our traditional workshops, from the most ethically sourced and quality materials. 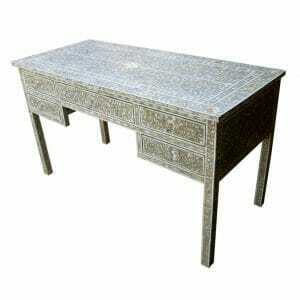 Our selection of desks is finished with a choice of exquisite inlays. 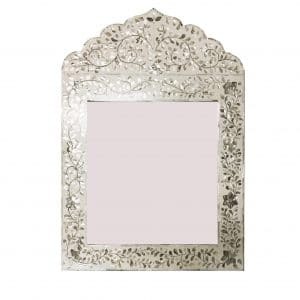 The first possibility is our glittering mother of pearl designs that ooze opulence and pizzazz, or, secondly, our equally head-turning and regal, camel bone inlay. 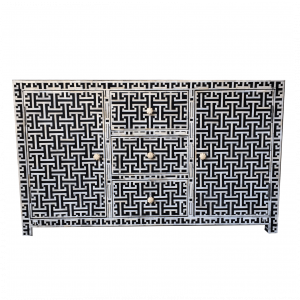 Both materials are skillfully embossed into the solid Sheesham and Mango wood and are then shaped into mosaic-like, intricate, traditional Indian Rangoli designs. Who Makes Ethical Artisan Desks? 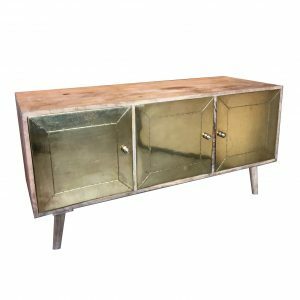 At Iris Furnishing we pride ourselves on our ethical approach to furniture making and have long been committed to selling eco-friendly, ethically made and fairly traded artisan Indian furniture. We’re familiar with the production process from wood-carving to surface smoothing and we know where the wood comes from, how the shells are cut and how camel bone is harmlessly harvested from camels that have passed on from natural causes. Our love of India and respect for the traders and master craftsmen who’ve perfected their craft means that we ensure fair deals and equitable agreements for every purchase we make. The solid hard wood that makes up the sturdy framework for our desks and other furniture is always mango or sheesham wood. These trees are often grown in small holdings or on the outskirts of land and when they have stopped fruiting, (in the case of mango trees) they are traded through auctions, where the selling of wood is closely governed to ensure adherence to India’s forward-thinking forestation policies. These trees not only offer us the ideal hard wood for making desks and other long-lasting furniture items, they are replanted and are fast to regrow. 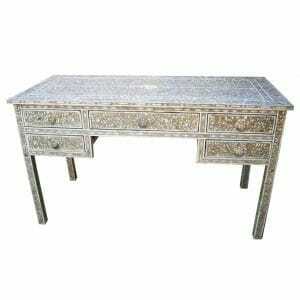 Can I Order a Bespoke Solid Wood Indian Desk? Absolutely, yes and the skilled workers who craft these beautiful examples of artisan office furniture love creating original pieces from their endless repertoire of contemporary and traditional craft and design skills. Just let us know the measurements you’re looking for, including details like the number of drawers and which finish you’d like and we’ll furnish (sorry) you with a quote straight away. That means you don’t have to wait to settle on all the finer design details before getting started. What's the Cost of Ordering a Custom Built Desk? 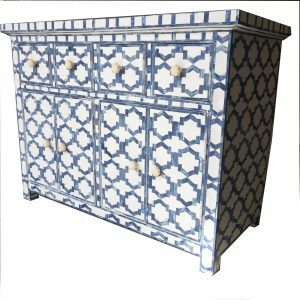 We charge nothing for the bespoke service and there is no obligation to proceed with your quote, which we happily help you change and adjust until you are absolutely happy with your proposed item. 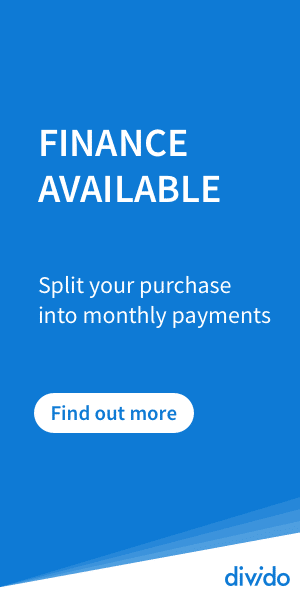 All bespoke orders can be paid for upfront or in two instalments, depending on your preference and it may interest you to know that bespoke furniture is priced just the same as pre-made furniture, with the cost adjusted to account for size and surface. We can help you finalise the details and let you know how long you can expect to wait for your desk to arrive with you. Who Sells Solid, Well-Made Wooden Desks? The wood in our artisan desks is planed, carved and polished from timber bought at auction and constructed to form a robust framework, designed to support heavy usage as well as take heavy weights. Internal and External structure is made from solid wood and the drawers are made to hold weighty items, with the option to have bespoke made to measure drawers for the optimum depth and width to meet your needs. 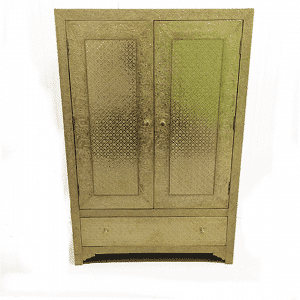 At Iris Furnishing we recognise that quality means longevity and what we love about our Indian furniture is its ability to match beauty with practicality. Strong, well made desks support your use over the years, while the detailed, ornate patterning withstands changing fads and fashions with its timeless appeal. 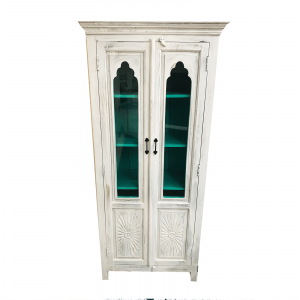 However, if you’re looking for the benefit of sturdy, well-constructed solid wood furniture without the ornate finish, ask us about our distressed wood and painted furniture options and we can have a white or single colour wood desk made to order for you. 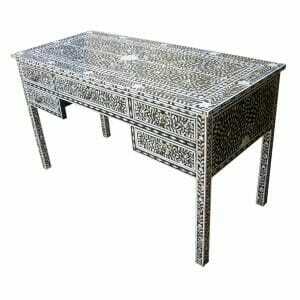 How to Style Your Office with an Artisan Indian Desk? From the gateway to the Thar desert in Northern India, to our Brighton showroom, beautiful creations like these hand-crafted hard wood desks make their way over the seas to us at Iris Furnishing, where they are delivered to your door. With both UK and International delivery options, fine Indian furniture can find its way to you, wherever you’re creating your perfect work space. 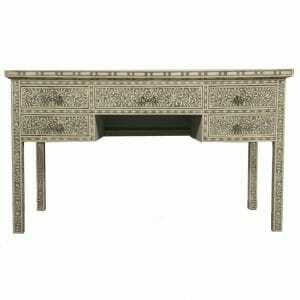 Highly ornate, intricately decorated and beautifully coloured, these desks are made for inspiration in your work place. 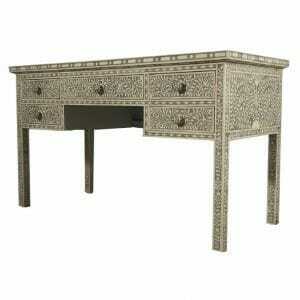 Constantly stimulate, uplift and enliven your home office with finely turned artisan craftsmanship. Match a neutral colour scheme with soft, understated grey inlay, or for a more austere elegance, black contrasts neatly with the light, naturally variant patterning. White gives a crisp, space-creating lightness to a space and for a more creative feel to your workspace, desks can be ordered in a choice of colours to match your preferences. Have a look at our inlay furniture collections to gain some inspiration, or give us a call here and we’ll be happy to answer your questions. How are Indian Desks Made? These fine examples of skilled workmanship are crafted by hand from timber to turned joint in the workshops of Rajasthan, where the traditions of their ancestors guide the carpentry techniques of today’s master craftsmen. Originally fashioned for the regions’ palaces, Rajasthan’s royally patronised craftsmen have long upheld their prestigious reputation with furniture made for longevity, from solid hardwoods with fastidiously finished joins and smooth, polished surfaces. 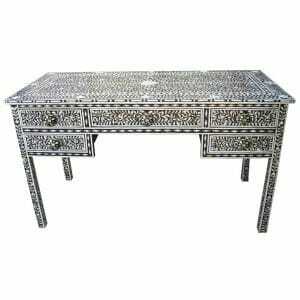 The exquisite attention to every detail gives these desks their characteristic elegance, whether in mother of pearl inlay, camel bone decoration, carved wooden designs or plain distressed wood finish. We enjoy regular visits to the workshops and love nothing more than to watch these creations form under the skilled hands of artisans who have long ago mastered their craft and are now constantly creative with it. 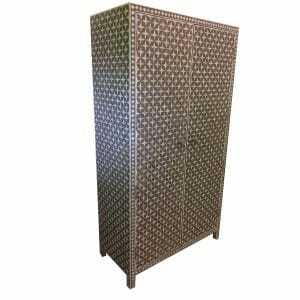 New designs and innovations reach our collection on a regular basis, bringing delight to us and to our customers.